The latest work “Ladle’s Gumption” has been released, for the general public to watch, see and criticize! A couple of months in the making process, after a year of ideas coming together. During this productive 2nd year of artistic residency at the DoJ art college the series evolved from silver, inche long, bottomless spoons to cast bronze, foot long, ladles! The series will be on show in the Lighthouse (AIR16), Glasgow until the 1st of June and simultaneous at the Cooper Gallery during the degree show week at DJCAD. The work is accompanied with a video detailing the technique used for the cast bronze, done in the foundry facilities of the art colege with the support and guidance of Roddy Mathieson, the college casting expert. This body of work came into being through an intuitive dialogue with the materials that it is composed of, that is, wood and metal. The empathy, or lack of it, between people, is the starting point for a jaunt around the kitchen table. 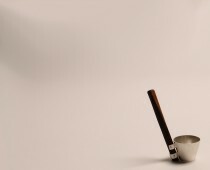 Ladles are quite analogous to people, their behaviour and spirit, both collective in nature and yet individual in body. The making process was a crucial part of the project, labour intensive but highly rewarding techniques were employed, such as sand casting and wood spinning. The results are presented in a way that resembles the ordinary and the everyday, with a focus on textured surfaces and subdued tones. The modern, mundane and ordinary are the root inspiration. Our life incased, as an individual being, where we feel strong and untouchable, or in collective, open to the breeze and its spring allergies. The contact with the material is of extreme importance, it takes over the idea from a blurred moment, somewhere between the start and finish of the 1st piece of work, what still not sure if good or not, but seems to make near complete sense. As if the material leads the way once the mind manages to get the hands to start making.